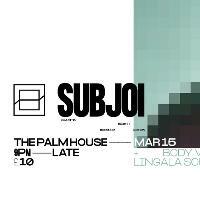 Not to rest on our laurels, we're bringing Austrailian house prodigy Subjoi to Belfast in March. With releases on labels such as Lost Palms, Piff, Heart to Heart and 13th Hour, he's been releasing brilliant, club-ready tracks since his first foray in 2016 with his Happiness EP. Think luscious pads and throbbing basslines paired with raw drums and you've got the picture. His newest EP, The City, released on GASP in December 2018 and has been a mainstay in our sets since then. Support on the night comes from our residents and Belfast's own Lingala Sound, who we're stoked to be pairing up with.